It feels a bit indulgent, but today we’re trotting out one of our very most favorite monikers for Name of the Day: the virtuous Verity. In 2007, American parents welcomed more than 1,600 baby Hopes, 4,200 little Faiths and a whopping 9,500 bundles of joy called Grace. If there were any newborns named Verity, they were far too few to record. This name has never been in the Top 1000 in the US. 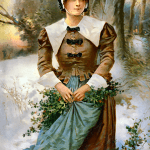 While reputable sources list Verity as one of many monikers favored by the Puritans, along with Mercy and Felicity, it’s important to remember that not every child born to a reform-minded mama would be christened something unusual. It was simply a moment when a certain type of creativity in baby-naming was appreciated, and roughly 20% of parents favored appellations that reflected qualities they hoped their children would embrace. There weren’t hordes of Veritys in simple wooden cradles back in the day, and you won’t find them by the dozens in their Bugaboo Cameleons now. Instead, Verity pops up as a character’s name from time to time. She was worn by Madonna for her cameo as a fencing instructor in the 2002 James Bond film Die Another Day. Pierce Brosnan played Bond; Halle Berry appeared as NSA agent Giacinta ‘Jinx’ Johnson and Madonna also contributed the theme song. In one of the later Harry Potter books, Verity is a sales clerk in the Fred and George Weasley’s shop on Diagon Alley. There’s something vaguely British about the name, perhaps reflecting the heritage of the few real bearers. Verity Rushworth appeared on the ITV1 soap opera Emmerdale; Verity Charlton was seen on the Australian soap Neighbours; Verity Sharp can be heard on England’s Radio Three. And, of course, sci fi fans everywhere owe a debt to Verity Lambert, the pioneering female producer responsible for the launch of Doctor Who on the BBC back in the 1960s. But check old census records and it appears that at least a handful of women have worn the name in the US, too. The meaning comes directly from the Latin veritas. While it isn’t as obvious as naming your child Truth, it’s not too far off. But we’re biased. We’ve worn Verity as a screen name for years, and it works nicely – unexpected, but not confusing to say or spell. And while it sounds a bit quirky, it also sounds smart. We think it would wear well on a small child circa 2008. I have a friend called Verity which is how I discovered the name. I love both the meaning and the sound of the name. My name is Verity, Emma and I love it! I am now 14 and It has suited me since I was born. Ever since I was a baby I have been getting compliments. I have dark brown hair and I dont think Verity is a name thats suits a blonde child. I find Verity to be very charming. It’s a pretty sound and a pretty meaning. I also think she’s more modern and less fussy than Felicity. I’m not much of a virtue name sort of girl myself, but I thoroughly appreciate Verity and Mercy as virtue names for the new millennium. I like Verity. It’s a pretty name, and I’d love to see it over a Grace or Faith anyday. Vera would be a lovely nickname for Verity, but I think it’s nice as a stand alone name. I’ve never quite known how to pronouce it either; I’ve always though it was VAIR-a. I also like Vrai, the literal French word for truth. If parents are looking for a different, underused one-syllable virtue middle name, Vrai would definitely be a better choice that Faith or Hope. I thoroughly like Verity, nickname potential or not. I like her meaning and find it more “needed now” than Grace or Faith (Amity’s another favorite). I like Verity’s warmth and verve very much. I find her peppy, spunky and happy. Verity gets a :thumsup: from me! Lovely! You mentioned Vera as a nickname for Verity. But I’ve always struggled with the pronunciation of Vera. Is it Veer-a or Vair-a (rhymes with Fair-a)? […] – Along with Vrai and Verity, this one tends to be listed as a girls’ name, just like Sister Wives‘ Truely Brown. […] BBC deejay Jo Whiley’s kids’ names take center stage at Mer de Noms – and really, they’re great – India remains one of my long-time favorites.